Nicholas Wilson has been painter, sculptor and printmaker for over 40 years. His main career focus has been on wildlife art, where special emphasis on drawing has opened up numerous opportunities for him. While curator of exhibits at the Arizona -Sonora Desert Museum (1970-72) near Tucson, he developed his talent for expressing his deep love for nature. 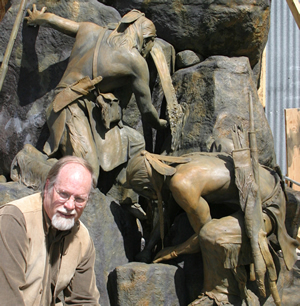 In the last few years, the artist has added monumental size bronzes to his sculpture experience. 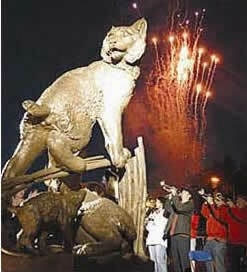 “The Wildcat Family” (2004)–commissioned bronze of two adult wildcats and two kittens stands 11 ½ ft tall at University of Arizona in Tucson. October 2011, the artist received first place and a purchase award from the Modesto Art Museum’s World Mini Print Exhibition in California for “Empty Nest II” etching of a bird’s nest with stars. Nicholas Wilson is represented in permanent collections of the BOOTH WESTERN ART MUSEUM, the COWBOY HALL of FAME, the LEIGH YAWKEY WOODSON MUSEUM of ART, and the SMITHSONIAN (etchings). His artwork has been exhibited extensively both in the U.S. and abroad. He enjoys representation in several corporate collections. Publications include articles in magazines such as: SOUTHWEST ART (cover) 2011, 2012, and 2013. ARIZONA HIGHWAYS (cover), U.S. ART, WILDLIFE ART, SOUTHWESTERN ART. Book publications: THE BEST of WILDLIFE, Northlight Publishers, 1998; WILDLIFE ARTISTS at WORK, Watson-Guptill, 1981.